Scotland's woodland cover probably reached a post-glacial peak about 7,000 to 8,000 ago. Since then human activity and climate change have reduced that native woodland to a few scattered remnants. What Scotland's mountains ought to look like below the tree line. Pine forest on the better drained, acid infertile soils in the straths of the Central and Eastern Highlands are my favourites with a range of ages from bright green and new to dark, gnarled red barked veterans of 200 years or more. Beneath the canopy and in clearings blaeberry, cowberry, mosses and heather predominate. These remnants are one end of the boreal forest that girdles the sub-arc tic. If you want to see it visit Glen Affric National Nature Reserve this is what Scotland's mountains ought to look like. I have long wanted to visit Glen Affric, this weekend was an opportunity. I needed to take a trailer up to Glen Urquhart to collect hay so decided to make it a two day trip combining this with a walk into Alt Beithe hostel in the heart of the glen. on a stony track from the Forestry Commission car park at the S.E., end of Loch Beinn a Mheadhoin (Ben-a-vaydun). You walk through a succession of woodlands, from mature pine wood, through naturally re-generating woodland where deer and sheep have been excluded out into the higher altitude grassland of the upper valley. The Forestry Commission, Scottish Natural Heritage and National Trust for Scotland are showing how Scotland's natural woodlands could be restored by excluding deer and sheep. If you are a "Guardian" reader you'll be familiar with George Monbiot's writing and the case he makes for "re-wilding" Britain. George outlines his philosophy, rationale and strategy in; FERAL, Searching for enchantment on the frontiers of rewilding, Allen Lane, 2013. We could make a contribution here in Ormsaigbeg by establishing a community woodland on the common grazing! 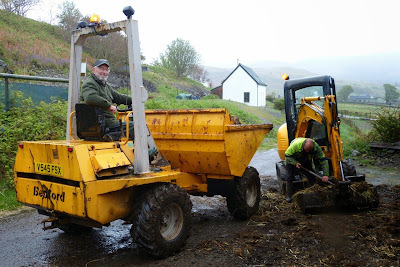 Last year it took three days to clear out the compacted manure in the sheep house using a muck graip and a wheelbarrow. If you remember I did have help , "Dude Crofting" helped out but this year there are no dudes in sight. I've moved on, into the 21st century. Hughie and I with the mini digger and his dump truck did the job in and hour and a half. This valuable stuff is now piled up in a midden to rot down over the next 12 months after which it will fertilise the hay park adding N, P, K and organic matter. In the absence of a muck spreader Gillespie came in with his big green tractor and bucket yesterday to dump heaps of year old muck at intervals across the field which were then spread by hand as far as we could throw it. If it ever dies up the chain harrows will spread it a bit further and help if to break down. If you want to heat your house, your water and to cook using firewood its a lot of work, a second part-time job. This week I spent three days hauling wood from the Forestry Commission firewood depot. The plan was to saw, split and stack it in the woodshed. The stacking was stymied by a, "force majeure", hen blackbird nesting in an empty log basket. This is a far from secure nest site. Mimi the wildcat hybrid can't get in but the shed is designed for drying wood with gaps between the wall cladding that are no problem for a pine marten. Mimi seems to prefer small furry creatures, they provide much more entertainment and can be stored under the sofa for later. Mean while the cut wood has been tipped in the sheep house, a long carry to the wood burner.